"Brick Bldg, Lg Windows w/ Xlent Views, Partially Furnished, Renowned Architect" is John Baldessari's new installation at the Haus Lange from 1928, in Krefeld, Germany. The project furnishes the house with Baldessari's surreal nose- and ear-shaped furniture. 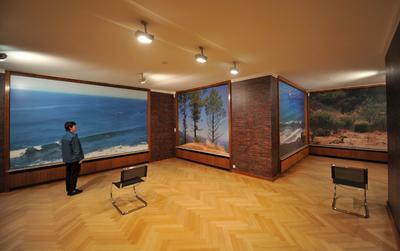 In addition, the windows are lined with pictures of California seascapes on the inside, entirely blocking the views to the exterior, and reflecting Mies's indoor-outdoor connection back inward. From the exterior, the windows are lined with pictures of bricks, further killing the Mies effect. The effect is deadening, and powerful. It causes the visitor to notice the power of Mies's original arrangement, the levels of zig-zag transparency, the scale of the glass, the pervasiveness of the brick both inside and out. In a way, the project celebrates Mies, even as it temporarily disrupts the way the house works.